Step 3: Choose the Music Tab. Step 4: Select Voice Memos from under the Voice Memos heading in the left-side list. Step 5: Hit 'Copy to PC/Mac' and chose where to save to. This functionality is only available for those iPods and iPhones that support voice memo recording. If your iPod or iPhone support the recording of Voice Memos (or Voice Notes), TouchCopy can play and copy those recordings on your device. 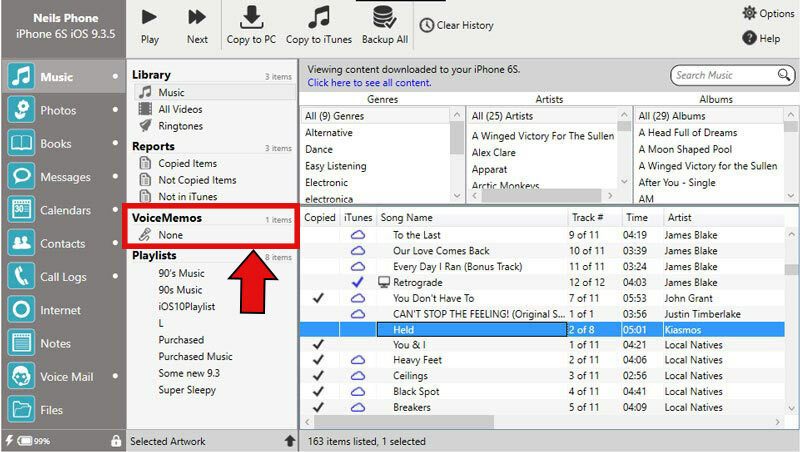 If TouchCopy detects that your iPod contains Voice Memos, the TouchCopy source list will display the categories of voice memos present under the "Voice Memos" heading. Clicking on one of the Voice Memo categories ( such as None, Idea, Lecture etc ) will display all the voice memos made under that category. To show all the voice memos on your device, shift click all of the categories shown in the source list. Once your required voice memos are listed in TouchCopy you can use them just like any other audio file in TouchCopy. Select the Voice Memo you wish to listen to through your PC or Mac and click the play button in the TouchCopy control bar. How to Transfer Voice Memos from iPhone to Computer- Select the voice memo you wish to copy to your computer and click the "Copy to PC" or "Copy to Mac" button in the TouchCopy control bar. TouchCopy will copy your voice memos to a location on your hard drive selected by your TouchCopy options, by default this is your computer desktop. TouchCopy also produces an XML file named after the voice memo category you are copying (by default this is None). This XML file can be used to import the voice memos into iTunes as a playlist. Select the voice memos you wish to transfer to iTunes and click the "Copy to iTunes" button in the TouchCopy control bar. TouchCopy will copy your voice memos into iTunes as a playlist, named after the category of voice memos you have chosen to copy, by default this is None. Alternative labels include Interview, Lecture, Memo, Idea, Podcast or any other category label you may have chosen on your iPhone.